Happy Friday! I hope all of you (yes, all three or four of you who actually read my blog) had a lovely Christmas week and were able to be at home with family and friends. Thankfully, I am not working this winter and am able to spend my entire break at home. It's so nice to not worry about writing papers and studying for midterms! I will always love using Bath and Body Works' body lotions on my legs. (You'll probably hear me mention that a million more times on my blog.) Their scents linger for a long time and their lotions are surprisingly very moisturizing! I like them a lot more than the Victoria Secret body lotions and have already stocked up on three lifetimes' worth (you can view the damage done in this post from July). I did like this, but I probably won't repurchase this again because the L'Occitane hand cream is more moisturizing for me. It smells like a combination of grapefruit and baby wipes, which is a little strange ... but it did work very nicely at exfoliating. I will probably not be repurchasing this because the smell weirds me out, but it wasn't a bad cleanser. I will never buy these or anything that has "Fresh Effects" in the title ever again. It smells like hair dye and it burned my eyes really badly, even when it didn't come into contact with them. I think it's just the scent that irritated them, but I would stay away from these if you have sensitive eyes or skin. This was the very first powder I've ever used (I always thought that using powder meant that you had to wear foundation ... don't ask me why I thought that) and I had a good experience with it! It lasted me a good half year, so I may repurchase it after I finish my Tarte Smooth Operator Amazonian Clay Finishing Powder sample (which is awesome, by the way, but I hate using loose powder.) OR if you have any good pressed powder recommendations, let me know! The only toner I've ever tried and will probably only try. It gets the job done and smells as normal as toner can smell. I use this after I remove my makeup, but I still like to wash my face afterward. I've already bought two more during their Cyber Monday sale, hehe. This stuff is magic and my lips would probably scare away all of humankind if I didn't use it everyday. I bought this thinking it'd be a good size to try, but it didn't last me very long. However, I do like the scent and have purchased the full size version in Blush, which I mentioned in this post. If you're looking to try a Batiste dry shampoo, I would just go for the full size! This is definitely going on my list of favorite mascaras. It's very hard for me to find a mascara light enough to keep my eyelashes curled. Mascaras are usually too heavy and cause my lashes to fall almost immediately after application, but THIS STUFF. Cover Girl, bless your souls for creating such a great mascara. YAY, I can finally throw all my trash away! Sorry if this was a bit long, but I hope this was informative and helpful. Was your opinion of something I mentioned the total opposite of mine? It's always interesting how the same thing can be so different depending on who you are! Hand Food is one of my favorites of all time! I actually bought that for my mom for Christmas. How fun! 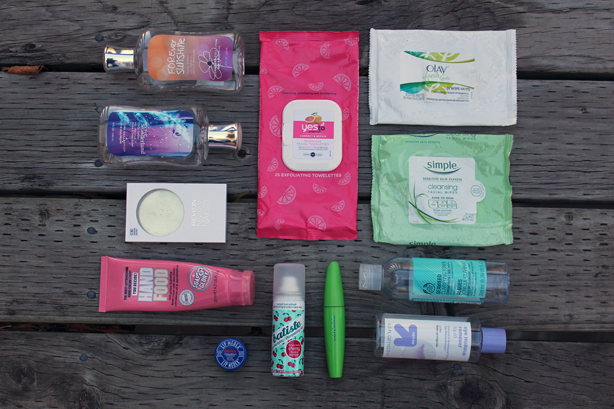 I don't think I'd have the patience to do an empties post, haha. I haven't tried the Target makeup remover, but it definitely seems like a good purchase. aaah dry shampoo is a lifesaver!